Wherrrrree oh where, are you tonight? Why did you leeeeeave me here all alone? Ah searched the world ova and thought I found true love. You meeeeeht anotha and pfft you was gone. One of the best memories I have growing up happened on Saturday nights when Oogie was out carousing places like The Cat's Meow (hi, Kristina!). Oogie left me and Rhonda in the care of a redneck babysitter who had a couch covered in perforated plastic (it stuck to my thighs, ow) who liked that ole show called Hee-Haw. Don't know that one, Beth? Wait for it. So anyway, Oogie left her only two begotten children with a red-necky sitter who liked to watch this show called Hee-Haw co-hosted by musicians Buck Owens and Roy Clark. I think it aired in the mid-to-late-seventies--that magical period of time before me and my sister discovered there was like, this, big difference between girls and boys. 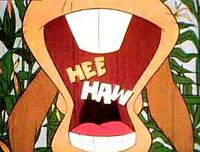 I remember that the show started with a bunch of people sing-songing hee-hee-hee, haw-haw-haw. And I loved laughter, people could always count me in for anything laughter-like, so I always sang hee-hee-hee, haw-haw-haw along with them. The thing I didn't understand was what that thing was with all the teeth. And I never did figure what it was until later (I didn't know a dang donkey had buck teeth). But I did know it was a fun, uplifting kind of show. I'm sure I didn't understand 85% of what was going on, but I watched for the Pfft! And you were gone song. I lived for the moment I could wail and spit at the same time. I miss shows like this--homespun innocence--good-natured humor that doesn't poke fun at a celebrity's psyche. Since when did making fun of a living, breathing person become the norm? You ARE still here, Hee-Haw! Guess who hit the jackpot again? I didn't get to go to the RWA Conference in San Francisco this year, but I did get me some booty, compliments of Jodi. She is the bomb. If I haven't been blogging lately, you know who to blame--it's because I've been busy reading. 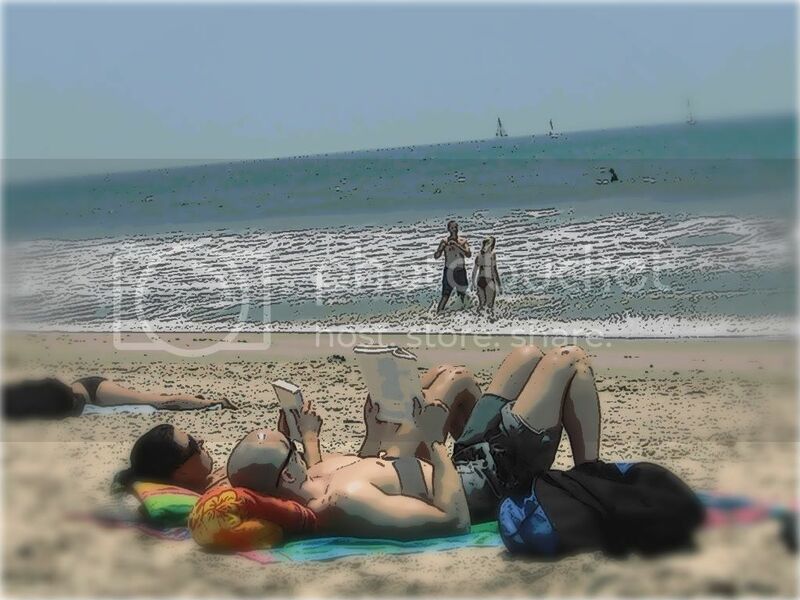 If you click on the photo, it'll take you to an almost life-sized photo. There are books galore, magazines, bookmarks, a mouse pad, buttons, CDs, brochures, um...placards (? ), story excerpts and a whistle to blow on when I get too hot. Best promotion tool you can give? Hands down, one of your books. Nothing else is going to hook me harder than your story, so thank you to all of the authors who shared their books. And again, thanks to Jodi for taking the time and effort to collect (and spend the money) to ship them. Not only was she doing ME a good turn, but she also helped to promote fellow writers. You rock! Uninvited by Alanis Morisette is the song my hero heard while I wrote this part of the story. Bring Me To Life by Evanesence is the song my heroine heard (thanks, Becky). The painful wheeze wrenching my body gradually slowed into pants, making my throat burn from the exertion. I tried to swallow and broke out into spasmodic coughs that made tears run down my face. Cool wetness splashed over the hands I’d cupped around my mouth. I opened my hands, my palms catching the liquid as it fell. Some of the water went into my nose, but I didn't care. The pain and dryness in my throat didn't let me. The water kept coming, even after I had recovered myself enough to take a breath that wasn’t painful. Suddenly, a bucketful dumped on me headfirst. It was unbelievably cold. Howling, I pushed myself up from the ground and sank onto my knees, covering my head with my arms. Vaguely, I became aware of a gurgling whuffing sound--like someone was being strangled. Startled, I opened my eyes and jerked my head back. A tiny boy stood a few feet away in front of me, bent double at the waist. His head was pale and bald except for the vibrant tuft of blond hair that looked like it had been gelled into a spike. He couldn’t have been more than three-feet-tall. Beside him, a container almost as tall as he was still dripped water. I rubbed the water out of my eyes and blinked at the boy. The troll. The unlikely troll who hadn’t killed me. “Why are you still alive?” I croaked. The gurgle-wuffing stopped immediately. Then, with his palms still braced against his little knees, the boy darted a look of disbelief at me and I realized he’d been laughing. His eyes were an incongruous shade of purple, beautiful, even as they narrowed and grew murderous at my question. My breath froze at the sound of the voice behind me. The warmth of the single syllable he'd spoken was a silken timbre that proclaimed him everything the legends had promised: impossible to escape, sexually appealing, able to kill with just a kiss. I had no doubt, during this moment when I was able to fully acknowledge the sound, that the real troll still lived. It meant I would be unable to defend myself in his world, because there could be only one survivor. ...and on the 7th day, she slept in 'til nine o'clock and even then, woke up reluctantly. I don't want to write about me. I just want to...write. I'm totally winging it here. I haven't dared to write in weeks, other than mindless stream-of-thought crap. My brain's been tied in knots. This is nothing, but I want to write it here anyway. Just because. Oh, what the hey. I've decided to try my hand at an online series. Plotting, worrying, and over-thinking what I write hasn't worked out so well, so I'm going back to the way it was when I first began writing. I'm totally winging the writing of this story, and have no idea where it's going to go or how it's going to end. For now, the title is Fairy Tale. I couldn't think about that and what it meant. I'd never wanted to die, at least not in the literal sense of the word, but then I'd never been licked from the inside out by the rainbow of need, excitement, curiosity and power that me left me gasping in wonder in its wake. Nothing else mattered but becoming another shade that comprised that rainbow. It wasn't the pot of gold I thirsted for. It was the so-called troll who protected the gold. His magic. His siren call. I wanted his powers. For the first time in almost two centuries, my family was in position to recall our lost power. He'd kill me if I didn't die by my own means first. He'd kill me, as the legends foretold, as gently as a kiss. Some troll he was--reputed to kill with a kiss? But some small part of me couldn't help being afraid. A Goth monster whose eyes bespoke of his evil nature would be less terrifying than an archangel who downplayed his intentions. I welcomed the forest's bone-chilling dampness, its utter darkness. Take me. I couldn't afford a human's vulnerabilities in this moment. I was here to die, to be born again. Please. Please. If I died first, his kiss would be reversed; kind of like the resurrecting power of the Prince's mouth against Sleeping Beauty's. Only that'd be where his story ended and mine began. And the troll--the troll who terrified me more than the thoughts I employed to deliberately still my heart--wouldn't know his mistake until it was too late. Interested in reading on? See the next part here. ...but it's easier to count the empty Sparkletts bottles. All I wanna do bang, bang, bang and take your muh-nay. I love this song by MIA called Paper Planes. This is a crazy dance video someone shared. Um. It's a bad idea to stuff a Ritz cracker in your mouth and cough before you've swallowed it. My best moments lately seem to come in blurts. Verb (foll. by out) to utter suddenly and involuntarily [probably imitative]. I take perverse pleasure in flushing the toilet when someone's next to me in the stall talking on a cell phone. Me? I'd have to scream. I can't run, kick or punch, but I've been told I have a hell of a scream. Hello, I would like to make a reservation for 4 in San Diego on Saturday, September 6. Yeah, so, I suspect you have a deluge of email by now, everybody eager to clap you on the back and slobber while doing it, dang them all. But I'm going to be Miz Joan Kul and just say woo. I'm finally ready to post a blog post and there's something wrong with my internet connection. Can't get on to anything but gmail. I tried Firefox and IE. Restarted my computer. Unplugged wires. Did the jiggy. Nothing. Oh, fuh cripes sake. Please overlook my dang word spellings. Pardon me while I bang my forehead against my desk a few times. Life is the same here for me. We're in August, which is one of the most unbearably hot months in LA (September being the other). By the time I make it to work in the mornings, I'm ready for another shower. It's someone else's turn to be Killjoy. Yep. That's right. I've already shared it all in emails, posts and wasted brain waves. So I signed on to the Internet as per usual, clicked my firebox ball of blue and red...and saw a google spam mail that procliamed Michael Jackson was dead? Which is, er, um, thrilling. But this is my favorite. I love the moves. I love the dance. I'm into the charisma. Stand back.